Happy to be Different, Happy to be Me! Home » Portfolio Items » Happy to be Different, Happy to be Me! 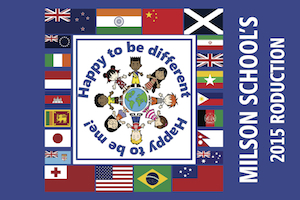 MILSON SCHOOL presented their 2015 school production, Happy to be Different, Happy to be Me! at The Regent on Broadway, Palmerston North on 9th September 2015. The audience was entertained by song, dance, and humour and Artisan Media was present to capture the moment. Matthew is about to have his first day at Milson School. He’s really worried that he won’t fit in because he is new and he is different. Most of the kids at school make Matthew feel really welcome … except for ‘the mean girls’. If you don’t live on the ‘right side’ of Milson Line then you live on the wrong side! Matthew learns, with his new friends, that at Milson School they celebrate and value difference. By the end of the day, Matthew, and the mean girls are “Happy to be different – Happy to be me”!